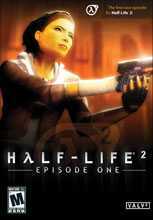 Half-Life 2: Episode One is the first in a series of new episodes for HL2, 2004's popular and acclaimed shooter. It details the aftermath of Half Life 2 and launches a journey beyond City 17. Stepping into the hazard suit of Dr. Gordon Freeman, you face the immediate repercussions of your actions in City 17 and the Citadel. Rejoin Alyx Vance and her robot, Dog, to once again aid the human resistance in their desperate battle against the totalitarian alien menace of the Combine. Episode One exposes Alyx's combat skills and knowledge of City 17. Battle side-by-side with her through Valve's first episodic game, a four-to-six hour adventure of greater density and detail than non-episodic releases. In addition to the new single player campaign, it also includes two multiplayer games - HL2 Deathmatch and HL1 Deathmatch: Source. And everything you need to play is included in the box – Half-Life 2 is not required to play. It's available for purchase online through Steam and in retail also.